The Deep State is real. It is a body of people, made up of influential members of the government beaucracy, the senior military staff, and parts of top-level finance and industry, who are involved in the largely unreported and uncountable manipulation or control of government policy. It is not a conspiracy theory, despite what the anti-Trump Lamestream Enemedia so raucously claims. It’s a long-established and proven fact or, at least, the political science is settled on this matter and the debate over its existence is over. 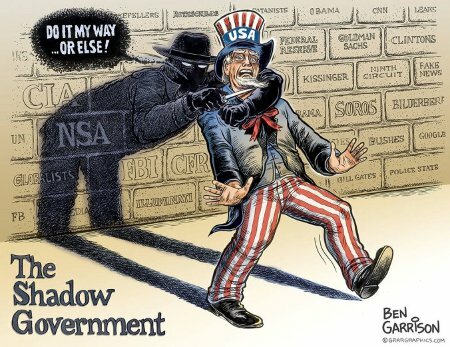 Three fine books on this Deep State, Shadow Government, State Within a State, or Double Government are: What Washington Get Wrong by Jennifer Bachner and Benjamin Ginsberg, The Deep State: The Fall of the Constitution and the Rise of a Shadow Government by Mike Lofgren, and National Security and Double Government by Michael J. Glennon. Each year unelected federal administrators write thousands of regulations possessing the force of law. What do these civil servants know about the American people whom they ostensibly serve? Not much, according to this enlightening and disturbing study. The authors surveyed federal agency officials, congressional and White House staffers, and employees of various and sundry policy-making organizations about their attitudes toward- and knowledge of the public. They found a gaping chasm between what D.C. officials assume they know about average Americans and the actual opinions and attitudes of those average Americans. 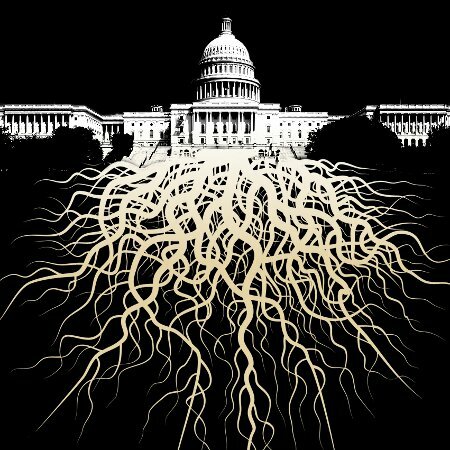 In a nutshell, the Deep State as longtime Republican party insider, Mike Lofgren describes it is a combination of elected and appointed members of the legislative and executive branches; and corporate insiders, especially the military-industrial complex, Wall Street, and Silicon Valley. Together, fueled by enormous amounts of money, they effectively control the country, regardless of which party is in power or the wishes of the electorate. Drawing on insights gleaned over three decades on Capitol Hill, much of it on the Budget Committee, Lofgren paints a gripping portrait of the dismal swamp on the Potomac that our government has become. National security policy in the United States has remained largely constant from the Bush Administration to the Obama Administration. This continuity can be explained by the “double government” theory of 19th-century scholar of the English Constitution, Walter Bagehot. As applied to the United States, Bagehot’s theory suggests that US national security policy is defined by the network of unelected executive officials who manage the departments and agencies responsible for protecting US national security and who, responding to structural incentives embedded in the US political system, operate largely removed from the public’s view and from constitutional constraints. The public may in large believe that the constitutionally-established institutions control the laws and public policy, but that belief is both unfounded and mistaken. Judicial review is negligible; congressional oversight is dysfunctional; and presidential control is normally nominal at best. People and whole organizations that were created and staffed without the People’s input treat politicians of all sorts as individual impediments that will in most cases be highly temporary. To put it in perspective one way, in 2014, 3,291 pages of new laws were passed by Congress – the sole branch of government with the constitutional authority to make law – and signed by the President. During this same period, unelected bureaucrats at dozens of federal departments and agencies issued 79,066 pages of new and updated regulations. Hence, unelected and only marginally accountable bureaucrats enacted approximately 24 times the pages of regulations that operate by and large with the full force of law that Congress enacted actual laws. To put it in perspective in another way, for years since 9/11, the CIA has kept and utilized a fully armed fleet of drones, mostly Predators and Reapers. They have literally made an unknown number of lethal strikes in Iraq, Afghanistan, Syria, Yemen, and elsewhere. I say an unknown number because any such strikes by the CIA are classified as Title 50 covert actions and the government cannot by law provide any information about how the CIA conducts targeted killings. Even the majority of Congress is disallowed oversight or complete analysis of these operations. Frankly, if they weren’t deranged and damaged, the hypocrisy of the Liberals and Progressives over the existence and their current denial of existence would be equally maddening and amusing. Have they not spent whole generations complaining about Big Oil, Wall Street, Big Ag, the Military-Industrial Complex, and Big Ag essentially owning the government no matter who is elected to office? Have the American people not had to hear them rant about the Koch brothers and ALEC since 2008? It seems to me that they’ve been complaining about the Deep State for decades. They just didn’t use or know the right term to use for it. But now that Pres. Trump and the American people complain about it, their mindless rejection and cognitive dissonance forces them to deny it and what they’ve been ranting about and against for at least the last half century. No, the Deep State is quite real. It’s not just some conspiracy theory and it’s not something that President Trump and/or White House Chief Strategist Steve Bannon cooked up, though they did drag the actual term out of the “hallowed” halls of academia and into the light of day. The government is more than what you see. It’s roots run both deep and far and are largely hidden from sight. Or, said another way dearer to my heart, Prof. Glennon ‘s Madisonian Institutions that we see are just like mushrooms; they’re just the visible, fruiting body but the rhizomes make up the bulk of the fungus, do most of the work of keeping it alive, and are perpetually hidden from sight. Being real, however, doesn’t automatically means that they constitute a subterranean web of common and nefarious purpose. One, the various groups don’t normally have a common purpose with each other. Two, whether or not any of those purposes are truly nefarious is a matter of supposition, perspective, and one’s value judgements. At the end of each and every day, these bureaucrats have their own interests just like the rest of is. They want to keep their jobs, above all. They wouldn’t have gone into the bureaucracy in the first place if job security wasn’t of tantamount importance to them. They will whenever possible act in ways to ensure that job security and will ally themselves with anyone and any policy which they perceive to enhance it. They will also work against and ally with those who also against whatever might infringe upon their job security. And that brings us to President Trump. Part of his platform was to “drain the swamp” that is the federal government. Pres. Trump even issued two significant Executive Orders (EO 13771 and EO 13777) which focus this draining squarely upon the various agencies who employ these unelected bureaucrats. Such act directly threaten those people’s job security. Hence, it’s hardly unreasonable that would they be and act as they could against him as they could. This entry was posted on Sunday, March 12th, 2017 at 12:47 pm and is filed under Books & Reading, Politics. You can leave a response, or trackback from your own site. Tried to hit like button but it didn’t like that lol. Anyway great post and very fitting choice of imagery with Uncle Sam getting shivved. Of all people Glenn Greenwald made it a point to call out the lefts new found respect for those in the shadows. Its a despicable situation and I hope the Right takes the proper position on this.